Against the background of prosecution of the leaders of Indigenous People of Biafra, IPOB, publisher of Champion newspapers, Chief Emmanuel Iwuanyanwu has said that he belongs to Biafra and that he remains a Biafran as an Igboman. Iwuanyanwu who was reacting to the recent release of Kanu from prison detention said was wrong, in the first place, to level treason charges against Kanu, noting that what Kanu has been doing mere expression of public opinion, which he said is no act of offence let along an act of treason. The former Presidential candidate made the statements at Amokwe in Udi local government area of Enugu state when he paid condolence visit to the family of late political scientist, Prof. Godwin Odenigwe. He noted that Odenigwe would be remembered for bringing about traditional rulers stool in communities of Igboland and for pioneering the creation of the local government system as third tier of government. 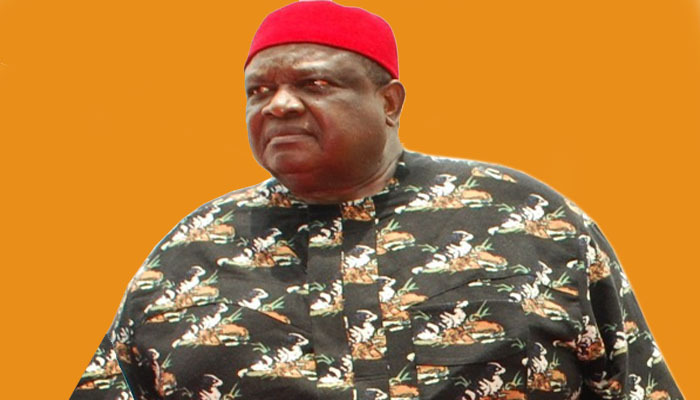 On Nnamadi kanu and Biafra agitation, Iwuanyanwu said: “I have always said that was no reason detaining Nnamdi Kanu. In the law of this country which I know unless you have arms. Nnamdi Kanu didn’t commit any treason. Treason is when you take up arms against the government, he didn’t take up any arms, there was no reason whatsoever for detaining him, because everybody have the right to say I want Biafra, everybody have the right to say I want Biafra. For God’s sake, I’ve made it clear to people that Biafra is for the Igbo. Hausas are Arewas, Yorubas are Oduduwas and we are Biafrans. “There is a problem we have because Biafra fought a war and people are ashamed to say they are Biafrans but I am not afraid to say I am a Biafran. Biafra is part of Nigeria, Arewa is part of Nigeria, Oduduwa is part of Nigeria; all of us are there. “If a person from Odududuwa takes up arms to secede from Nigeria, its treason but if one is just saying by words of mouth, it just an ordinary expression of public opinion. There is no law that makes such a person get convicted by just saying we want to secede, it’s a right of expression. “But if somebody from Oduduwa is amassing arms to topple the government to secede, its treason. If somebody from Arewa is amassing arms to topple the government, its treason, if somebody from Biafra, because all of us are from Biafra I am from Biafra, to topple government, its treason.